Compiled visualization of datasets from the East Pacific Rise (EPR) Integrated Study Site (ISS). At right, ship-based EM300 bathymetry (25-m resolution) shows the axial high between 9°46'N and 9°56'N [White et al., 2006]. A higher resolution bathymetry data set (5-m resolution) collected in 2001 by the autonomous underwater vehicle (AUV) ABE is overlain and shows greater details of the volcanic terrain [Fornari et al., 2004; Escartin et al., 2007]. Extent of the lava flows produced during the 2005-06 eruption shown by a black line [Soule et al., 2007] and high-temperature vents by blue diamonds. At left is a perspective view from the northeast. The EM300 bathymetry is elevated above a regional bathymetric map [Macdonald et al., 1992]. 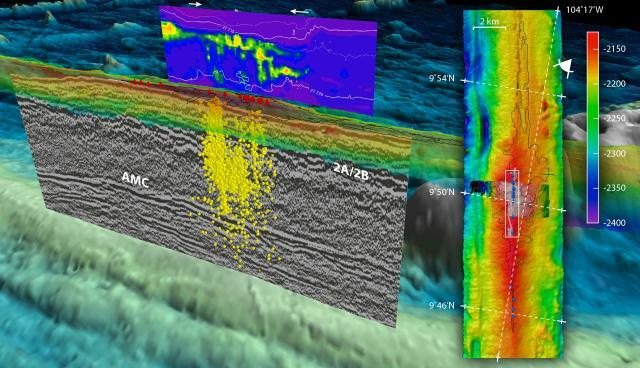 Multichannel seismic reflection data collected in 2008 [Carbotte et al., 2012] are shown relative to the EM300 seafloor. White labels show the crustal layer 2a/b reflector and the top of the axial magma lens. Hypocenters of microearthquakes recorded during 2003-2004 are from Tolstoy et al. and shown by yellow dots; hydrothermal vents by red diamonds. A profile of turbidity recorded in late May 2006 is shown above the EM300 seafloor [Cowen et al., 2007]. The EPR ISS “bull’s eye” is indicated by white arrows above the turbidity profile and by a white box in the plan view map. The ‘eyeball’ icon shows the direction of the perspective view shown in the main figure. All data depicted are available at the Ridge 2000 Data Portal. Copyright Woods Hole Oceanographic Institution.